Cannabis products for pets are illegal and unregulated, but that hasn’t stopped many pet parents from using them to treat conditions from anxiety to arthritis, often with purported success. What’s the truth? Is cannabis good for your pets? - Cannabis, hemp or CBD treats, food or supplements are not approved or regulated by Health Canada. They are illegal and could be quite dangerous for your pets. Discussions of treating medical problems with cannabis are not limited to humans. If cannabis may benefit humans, it may similarity benefit companion animals like dogs or cats. Considering that some of the major ailments cannabis is touted to treat are prime concerns for pet owners (anxiety, arthritis, pain) it makes sense for pet owners to be curious about cannabis. When discussing cannabis and companion animals, it’s important to define a few terms. Tetrahydrocannabinol or THC is the main psychoactive component of cannabis. As most pet owners aren’t interested in getting their furry friends high, the vast majority of pet-marketed cannabis products are free, or almost free, from THC. Which is good, because THC is quite dangerous for animals. Since it’s difficult to study cannabis (due to it’s soon-to-expire illegal nature) we lack recent numbers on the dose based effects of THC in dogs. Early studies report intoxication effects in dogs with doses between0.25 and 0.5 mg/kg of body weight. If your average German Shepard is about 30 kg, they would show THC’s effects after ingesting 7.5 - 15 mg, or about a 10th of your average “special” brownie. Cases of cannabis toxicity in pets have been increasing in States where legalization has occurred. We can expect much the same trend here in Canada. It really can’t be said enough that vigilance is crucial in keeping your pets safe. 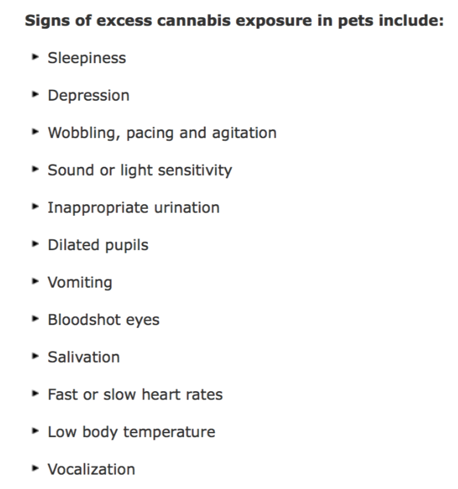 While it’s not likely that pets will die from cannabis exposure (through smoke or edibles) there can still be serious effects, especially if left untreated. Fluffy and Rover probably won’t get a kick out of the intoxicating effects of cannabis, given that they can’t understand what’s happening. Pets may experience significant anxiety, agitation or lethargy. Smoke of any kind can cause respiratory distress and potentially lung cancer to pets who inhale it regularly, due to the polyaromatic hydrocarbons created during incomplete combustion. Cats in particular are at risk of developing malignant lymphomas when exposed to secondhand cigarette smoke, a risk that may transfer to other types of smoke. . So what’s with all the cannabis products for pets then? Pet treats, foods and supplements in general feature no THC. They instead contain a different cannabinoid found in cannabis: cannabidiol or CBD. CBD is not toxic to animals like THC, and it does not cause the same psychoactive effects. CBD products for pets are marketed for their pain relieving, calming, anti-inflammatory, sleep-aiding and anti-nausea effects. But do they work? This study of 16 dogs with osteoarthritis showed a significant decrease in pain after treatment with CBD oil, but similar studies, or studies looking at cannabis to treat other conditions are seriously lacking. Dr Silcox mentioned many anecdotes of positive effects of CBD products on pets, and this survey have found that that well over half of all owners polled who have used cannabis products on their pets felt it helped. But anecdotes are never evidence enough. We need good, large, controlled studies to properly evaluate the potential benefits and risks of cannabis products on cats, dogs and other pets. We can be cautiously hopeful that cannabis could eventually be used in veterinary medicine to treat similar conditions for which it’s showing promise in human trials. The problem is, the list of those conditions is short. The outlook for cannabis in treating other conditions like anxiety, non-chemotherapy induced nausea or glaucoma is equally dim: “For most conditions (example anxiety), cannabinoid evidence is sparse (at best), low quality and non-convincing.” Despite claims to the otherwise, there isn’t any convincing evidence of cannabis’ ability to cure cancer either. I have three main concerns with regards to cannabis and animals. First, with legalization, there will be more cannabis in homes, which means more cannabis in a position to be eaten by pets. In states where legalization has passed cases of cannabis toxicity in pets have increased. There’s no reason to expect a different trend in Canada, something that worries me. Second, as Dr Silcox wrote, there is a “concern that that pet owners will attempt to medicate their pets with cannabis products and without appropriate guidance, put their pets at risk of adverse effects.” When we give our pets, children or ourselves any medication we first check dosage information, but the problem is that it isn’t available in any well researched, accurate or well-defined way for most species. Third, pet owners may use cannabis in lieu of other evidence-based treatments, putting their pets at risk or hurting their quality of life. We don’t really know what cannabis can or should be used for in animals, but that hasn’t stopped many owners from using it for things like pain, anxiety management and diabetes management. My fear, simply put, is that owners will choose cannabis over NSAIDS, over other pain killers, over insulin, and even over euthanasia. I hope that no animals are suffering as a result of receiving cannabis as an alternative treatment to conventional veterinary medicine, but my fear is that it’s already happening and will begin to happen more with legalization. Whether they work or not, they’re illegal and unregulated. Until October 17th, 2018 all products containing plant-derived cannabinoids (which includes THC and CBD) fall under the Controlled Drugs and Substances Act. But even after the 17th, it isn’t open season for cannabis products. The new Cannabis Act will regulate the approval and sales of cannabis products, meaning that anything sold legally will need to be approved by Health Canada. Now, that could soon change. With legalization around the corner, studies on cannabis and its effects are about to become a lot more feasible. With more evidence we will be able to hash out which CBD claims have merit, and which are baseless. With entire conferences being held on veterinary use of cannabis we can hopefully expect some answers soon. In the meantime, a few things remain really important. Knowing the signs of excess cannabis exposure in your pets. Being open and honest with your veterinarians in regard to your pets cannabis exposure, and your use of CBD supplements with them. You might enjoy the feeling of being high, but Spot will not. Keep the joint to yourself and feed him a dog biscuit instead.